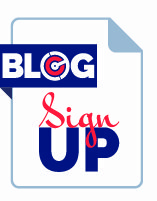 Survey confirms rates and capacity as top challenges for shippers, but not this week! Background: Choptank recently surveyed some of its top shippers. Eighty-one percent of the respondents have the title of either shipping or transportation manager. Forty-two percent said they use five or more 3PLS when arranging the movement of their company’s freight. 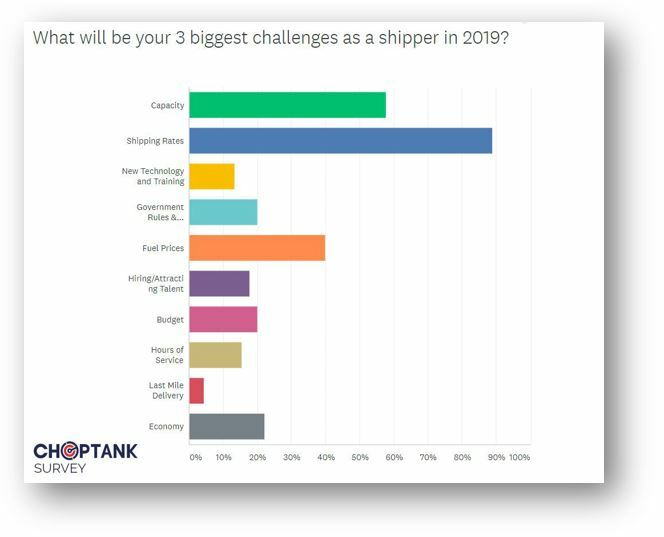 Purpose: The focus of the survey was to determine what our shippers feel are their biggest challenges going into 2019. With the “bullish” market at the end of 2018, the responses are what you’d expect, but the reality is we are seeing a current reprieve from the high prices and tight capacity. Freight Rates: At the top of the list of top shipping challenges are rising freight rates with 83.72% indicating it is their primary concern. No surprise when shipping costs in 2018 hit record highs. FedEx and USPS both announced rate hikes in 2019 and the trucking industry’s forecasts are predicting prices to continue to rise, although at a much slower pace than last year. 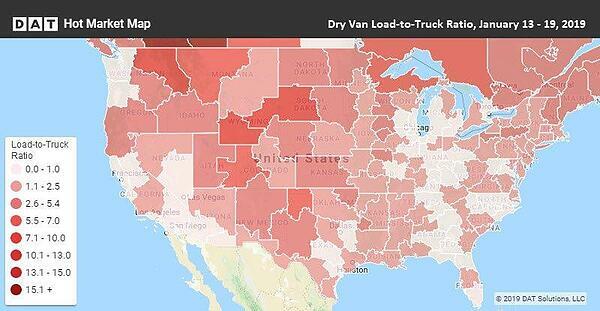 Right now, however, spot rates throughout large portions of the U.S. are inching down. Fuel Prices & Economy: Third and fourth place in the survey were concerns about fuel prices and the economy, respectively. Least of their concerns? Last mile delivery. When asked about their most common concerns, after transportation costs, supplier costs came in at 37.21% and damage or loss of inventory came in third at 23.26%. Supplier costs are tied in directly with the economy and there are predictions that there may be a slight downturn in 2019 which may have an impact on supplier costs. Conscientious shippers are always concerned about the loss of inventory and potential damages to freight, especially those in the food manufacturing business. Unfortunately, losses do happen - it's part of the transportation industry, but using a 3PL that has strict guidelines for product safety (FMCSA), and has thorough vetting practices for its for-hire carriers, is a 3PL you can count on. What technologies will affect shippers the most? 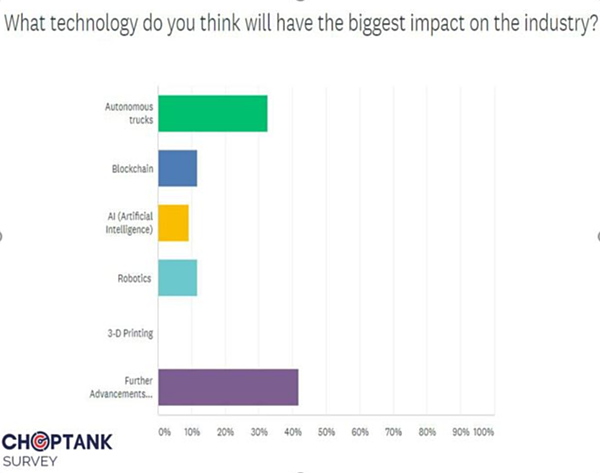 Forty-two percent of Choptank shippers believe that further advancements in track-and-trace and GPS will have the biggest impact on the industry with autonomous trucks following in second place at 32.56% of the vote. Blockchain technology, AI (artificial intelligence) and robotics were closely ranked third, fourth and fifth place, between 9-11%. Whatever your challenges, Choptank Transport is here to help you along the way. Contact us today.